Unfortunately, Missouri has seen more than its share of high-profile residential and work accidents caused by fires or explosions in recent years. The Law Office of Jeffery A. Hanna understands these are among the most complex personal injury and wrongful death claims a law firm can handle. Significant resources go into investigating such claims. And those who survive typically suffer very serious injuries, including burn injuries and disfigurement. Explosions can result from dangerous chemicals, coal dust and fuels, including propane and natural gas, along with Grain Elevator stored products. An increasing amount of attention has been paid to hazardous dust explosions in recent years. If you are dealing with a serious or fatal work injury in Missouri, contact the Missouri personal injury lawyers and wrongful death attorneys at the Law Office of Jeffery A. Hanna today for a free and confidential consultation to discuss your rights. Burn injuries can result from an automobile accident, a construction or work accident, a defective automobile or other product, or as the result of an apartment or building fire, especially in cases where exits have been blocked or other fire hazards have not been properly addressed by the building owner or management. Victims dealing with the aftermath of a serious burn injury need advanced medical treatment and experienced and aggressive legal representation. 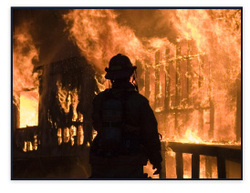 At the Law Office of Jeffery A. Hanna, we are dedicated to fighting for clients facing recovery from burn injuries. Investigating the causes of a burn injury can be critical to ensuring you receive the financial consideration you deserve for medical expenses, pain and suffering, lost wages, rehabilitative care and physical therapy or disability compensation. We will begin moving immediately on your behalf, using all of the financial, legal, medical and investigative resources at our disposal, to determine the cause of your accident, identify those responsible, and hold them accountable for their actions. The stress on families facing a burn injury can be overwhelming and the medical bills can be astronomical. At the Law Office of Jeffery A. Hanna we want you and your family to be able to focus on your well-being and recovery. Each member of our staff will move immediately to begin dealing with the doctors, hospitals, medical bills, bill collectors, employers, insurance companies, investigators and at-fault parties. As your advocate, we will fight daily to build a case capable of protecting your health and the future financial well-being of you and your family.